A Zagora 4×4 Sahara Desert Tour of Amezrou Silversmiths and the Ancient Jewish Mellah offers a unique flavor of the Sahara. Places to visit include the Dunes of Tinfo, the Amezrou Silver makers workshops, the Tamagroute Pottery Cooperative, the old Spiritual Zaouia site, the Koranic Library and an adventure into the M’hamid Dunes of Sahara Desert. Zagora is a town that is nestled within the Draa Valley river in Souss-Massa-Draâ, southeastern Morocco. Zagora is surrounded by the mountain Zagora and is how this Saharan town got its name. Zagora was originally called ‘Tazagourt’ the singular of plural ‘Tizigirt’, Berber for ‘twin peaks’, referring to the form of the mountain. In old European maps the mountain Zagora is can be found however the town itself was only built in the 20th century. On the top of the Zagora Mountain the remains of an Almoravid fortress can still be seen. A famous sign in Zagora is located at the town Border States “Tomboctu 52 jours”, the estimated time it takes to get to Timbuktu, Mali by camel. One of the most interesting and artistic places to visit in Zagora’s Sahara Desert is the Amezrou Silversmiths workshop located footsteps inside the old Jewish Mellah. The Silversmiths workshop offers a look back in time at how traditional Moroccan silversmiths and blacksmiths worked with silver by hand from the stage of creating a mold from scratch, melting silver, pouring the silver into the mold, with the final outcome being a creation of what is referred to as a Southern Crosses. The Southern Cross in Morocco and North Africa is made by both Berber and Tuareg Tribes. The Berbers refer to the cross as a Southern cross and also sometimes a fibula, which differs from an actual cross. The Tuareg refer to their crosses as either a Tuareg Cross or “Cross of Agdez.” Berber and Tuareg parents are known to give these exquisite crosses and silver beaded necklaces to their children when they are about to depart from home but they are worn by all as a form of good luck and protection. These well crafted crosses are 50% silver and 50% nickel. The Silver-making Workshop in Amezrou is the perfect place to discover silversmiths and blacksmiths working by hand and side by side creating silver jewelry and other precious items. The silversmiths and the blacksmiths, trained by the old Jewish population, are still using the models left by them to make fibula (pins to hold garments together) and medallions. The overall process of silver making is one that can be observed on a tour to the Zagora and M’hamid Sahara Desert during an M’hamid Morocco Travel vacation. In Amezrou a demonstration of how silversmiths and blacksmiths work is available along with a workshop where artists and guests can participate in the process and keep what they make. Amezrou, located just footsteps outside the 17th Century Jewish Mellah and home to the old Jewish Kasbah boasts a petite museum that is attached to its silver making facilities. 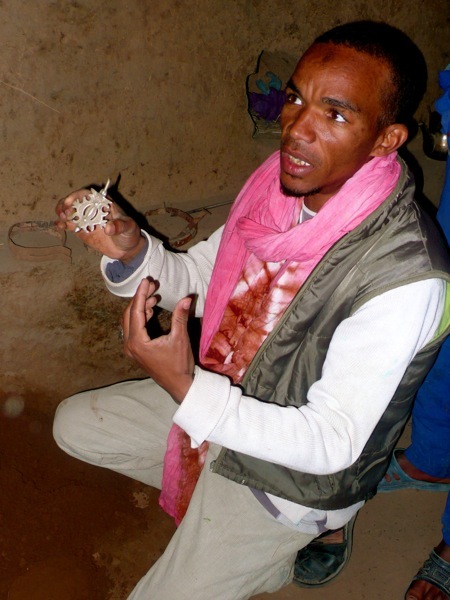 Silver jewelry is still produced there and workshops are available through Travel Exploration Morocco. Jewish people lived in this old Jewish Mellah for many centuries and controlled the silver trade. However they moved en masse to Israel in 1948, leaving about 7,000 Berbers to carry on the tradition. Today, Draouis are the sole occupants. The Old Jewish Mellah in Amzerou has narrow streets and covered areas that accentuate the high walls. The west door was once used by the Jews and the east by the Muslims. Amezrou has an old synagogue, which is in better shape than others in the Draa Valley. The old museum in Amezrou, Zagora has precious finds, some that are just for viewing and others that are for sale. On a recent tour Travel Exploration Morocco uncovered an old Jewish Menorah along with a fabulously decorated old Passover Seder plate. These antique Jewish items are treasures mong the ancient Jewish population which has mostly disappeared in the Moroccan Sahara. The Jewish menorah is a nine-branched candelabrum that is lit during the eight-day celebration of the Jewish Holiday called Hanukkah. The ninth holder, called the shamash (“helper or servant”), is for a candle used to light all other candles. 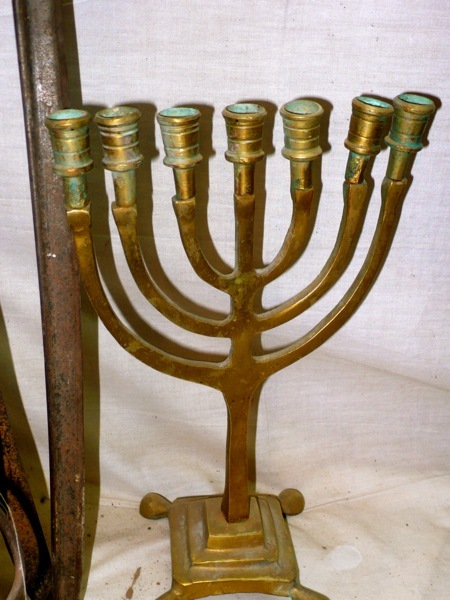 The menorah is among the most widely produced articles of Jewish ceremonial art and also a traditional symbol of Judaism. The Passover Seder Plate is a special plate containing symbolic foods used by Jews during the Passover Seder. Each of the six items arranged on the plate has special significance to the retelling of the story of the exodus of the Jews from Egypt;which is the focus of the Passover ritual meal. Visiting Zagora and the M’hamid Sahara Desert takes you off the beaten path. These Sahara Desert excursions are for those who are looking for a unique Moroccan adventure or die-hard authentic Sahara Desert Experience. This Morocco Sahara adventure will take you off the beaten path, visiting Zagora, Amezrou Silver makers and the M’hamid Sahara Desert of Erg Lihoudi, south of Zagora. It is for the die-hard Sahara Adventurers and is a great way to visit Southern Morocco’s Sahara from Marrakech and Ouarzazate. ►Pick-up from your Riad or Moroccan Hotel in Marrakech. Then take the Tizin’ Tichka pass through the High Atlas Mountains. ►Stop for lunch, in the village of Tadart and then witness women making Argan Oil, butter and cosmetics from the Argan Nut. Continue the road to Zagora. Spend the night in a beautiful Riad that is set within a palmary in Zagora. ►Visit the town of Zagora, the Tamagroute Pottery Cooperative, the ancient Zaouia site and the Amezrou Silver makers Workshop in the old Jewish Mellah. Visit the old Jewish Synagogue in Amezrou and the ancient alleys. Then take the road to the M’hamid Sahara. This part of the Sahara Desert is vastly different then the Sahara Desert’s Erg Chebbi Dunes in Merzouga. ►The M’hamid Sahara Desert claims a more rocky and desolate landscape with mile wide dunes and very quiet. 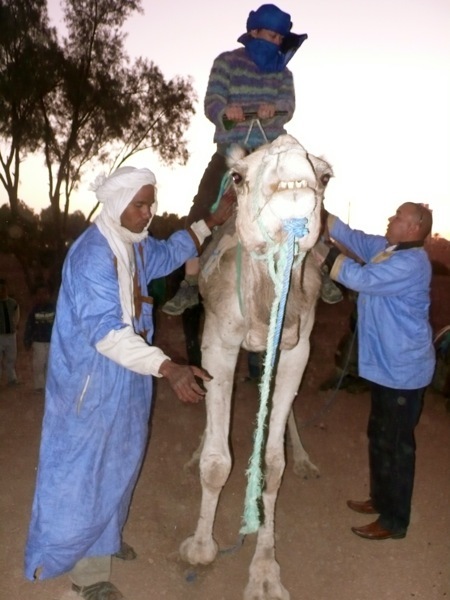 Visit the Erg Lihoudi after having your head fully wrapped with a dark blue turban by your camel guide. Take a camel trek at sunset across the M’hamid Dunes. Have dinner in the M’hamid Sahara Desert at your bivouac tent. Then, watch the blue men of the Sahara Desert bake fresh bread and prepare a meat and vegetable tajine. ►Spend the night in the M’hamid Sahara Dunes under the stars. ►Breakfast in M’hamid at sunrise and then explore by piste in 4×4 across the M’hamid Sahara Dunes. ►Continue the road to the Draa Valley, stopping for lunch with a Berber, Moroccan family in the village of Ait Ouzzine. Have couscous and grilled meat in Ait Ouzzine and enjoy discovering the Moroccan village’s green fields. Have your hands and feet painted with henna and then take the road to discover Skoura, the valley of one thousand Kasbahs. ►Discover Skouras’s Valley of one-thousand Kasbahs and then arrive at sunset at in Ouarzazate, visiting the ancient Kasbah and UNESCO World Heritage site of Ait Benhaddou. Ait Benhaddou is located 32 km from Ouarzazate lies the picturesque village. Aït Benhaddou of Aït Benhaddou is situated in Souss-Massa- Draa on a hill along the Ouarzazate River. Lawrence of Arabia was filmed here and Orson Welles used it as a location for Sodome and Gomorrah; and for Jesus of Nazareth the whole lower part of the village was rebuilt. In recent years more controlled restoration has been carried out under UNESCO auspices. Aït Benhaddou is one of many locations in this region used for shooting Hollywood films. ►Dinner in Ait Benhaddou and then continue the road and spend the night in either Ait Benhaddou or Ouarzazate at a traditional Moroccan Riad. ► Breakfast at your Riad and then take the road to visit the Oasis of Fint. Have tea with Aziz at the headmaster’s house in this quaint, beautiful Moroccan Oasis. ►Next visit Kasbahs Telouet and en route to your return to Marrakesh, driving through the High Atlas Mountains. You are currently browsing the archives for the Amezrou Old Jewish Mellah category.